I’ve been monitoring Gio Gonzalez‘s velocity for a good part of this season, after learning that it was down a bit early this year. His first few starts were not only a drop off from his 2012 numbers, but from his 2011 numbers, and, at times, from his 2010 numbers as well. A few weeks ago I declared he seemed to be back, after 2 starts in a row where he actually averaged slightly better than last year’s average. (By the way, while I think the 2 seamer is important, I was mostly concentrating on the 4 seamer. So when I talk about comparing average velocities here, unless I mention the 2 seamer specifically, I’m talking about the 4 seamer.) When I said the heat was on, or whatever pun, it appears I was speaking prematurely. We can see below, though, that after those two starts at the end of April, he had a string of 5 starts with below 2012 average velocity, before picking it up again in his last start. Is it exactly correlated? No. But, his top 4 games in strikeouts were his top 4 games in velocity. On the other side of the spectrum, he has had only 2 games where he’s struck out fewer than 5. In one (4/14) he had his second lowest velocity of the season, behind only his first start. In the other (5/27), his velocity was down, not only below his 2012 average, but just below his 2011 average (93.25 mph vs 93.47). 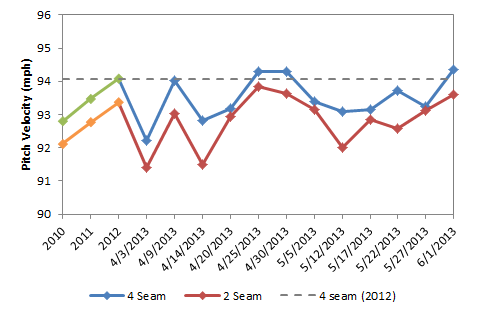 Interestingly, though in that 5/27 start, his 2 seamer was flying out of his hand, almost as fast as it went in 2012. Did the lack of difference between the two make a difference? Maybe, it was also one of his worst starts this year in terms of ERs, which could be from a variety of factors. But two pitches with the exact same velocity probably isn’t a great thing. 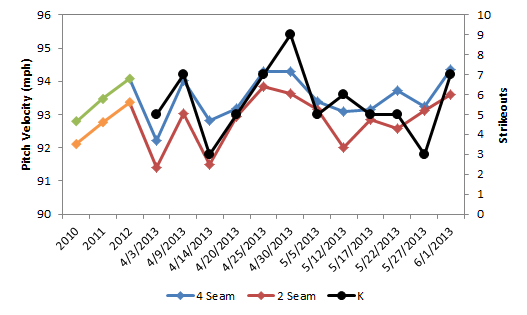 Taking a look at his ERs per start, it certainly doesn’t correlate anything like the K chart does. 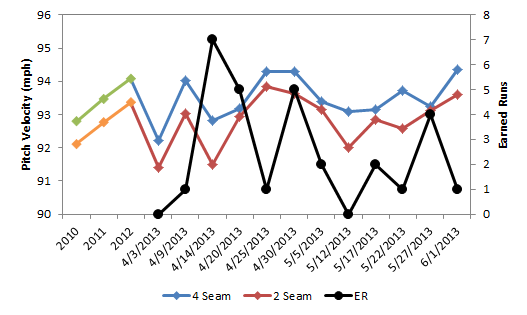 Even his recent starts, in mid-May, where his velocity was down, saw good results in the ER category. The degrees of separation – from velocity to Ks to ERs – are probably just too many here to tie them together. But strikeouts certainly contribute to effectiveness, so even if Ks and ERs are directly related, you’d probably prefer the Ks, which means you’d prefer the higher velocity. It’s important to remember that not only is velocity only one component of what Gio brings, there will be some amount of randomness involved when you’re tracking this stuff game by game. Some of it will certainly have to do with who he’s facing. On 4/30, Gio only last 4 IP, and gave up 5 ER – yet he struck out 9, the most he has all year. That was against Atlanta, a team that leads the league in Ks, but is 4th in Runs per Game. It is what it is, there is always going to be some noise in the channel here. But velocity is something certainly worth keeping an eye on with Gio, as he does seem to be at his best when he can average at least 93.5 or so. It makes sense, that’s where he was in 2011, and if he can beat that, he’s probably got some of his best stuff. The question is, how often will it be there? Once again, thanks to Brooks Baseball for the awesome data.